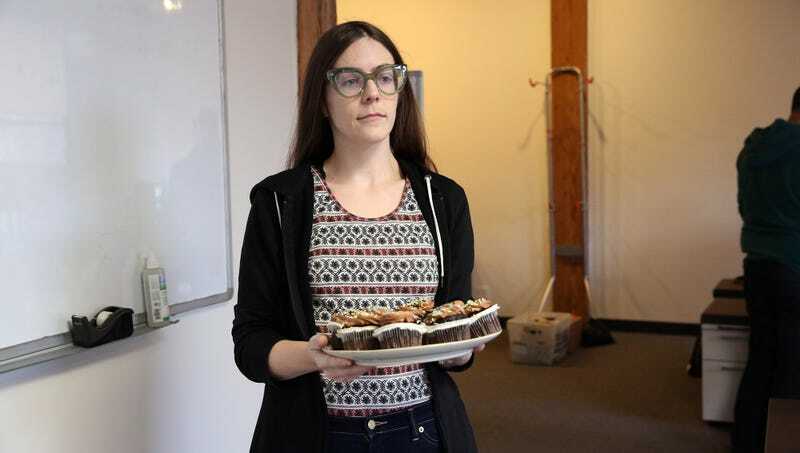 CHICAGO—Saying the desserts had begun to seem increasingly ominous, coworkers of Angela Shankman told reporters Thursday that their initial excitement had shifted to concern after their colleague brought baked goods into the office for the fourth consecutive day. “Don’t get me wrong, I love coming to work to find Angela’s freshly baked treats waiting for me, but after several days of this, you have to wonder if everything’s okay,” said Andrew Hastings, adding that he had been thrilled to see a tray of cookies sitting in the break room but has slowly grown more worried as brownies, cupcakes, pies, tortes, strudel, and rugelach subsequently appeared. “I tried asking her if this was from some big party she had recently, and all she said was, ‘No, I just wanted to make them.’ It’s certainly nice of her to do this, but, man, this can’t be a good sign, right?” At press time, Shankman’s coworkers grew even more alarmed upon receiving an email asking if anyone was vegetarian so she would know what type of lasagna to bring in for lunch tomorrow.